When it comes to containers, my mother is a pack rat. During my childhood, she would stand in the kitchen and examine the freshly washed packaging that had recently contained a take-away or pickles or some other condiment and ask if it could be used for anything else. This was an entirely rhetorical question, since my father invariably replied 'No', asking what she thought she was going to do with the first twenty jars that we already had stashed down in the cellar. One day she filled them all with homemade jam, which rather answered that question. (A updated retort might have been invented, but everyone was too busy eating to produce one). Being the king of rubbish sorting, it is perhaps not surprising that Japan has solved the problem of excess waste packaging. Here, everyone is all about refill pouches. These plastic bags with screw top caps are available for shampoo, detergent, soap and pretty much anything else you think you might want to buy twice, along with quite a few things you only bought as an experiment but now feel obliged to use for ever more. 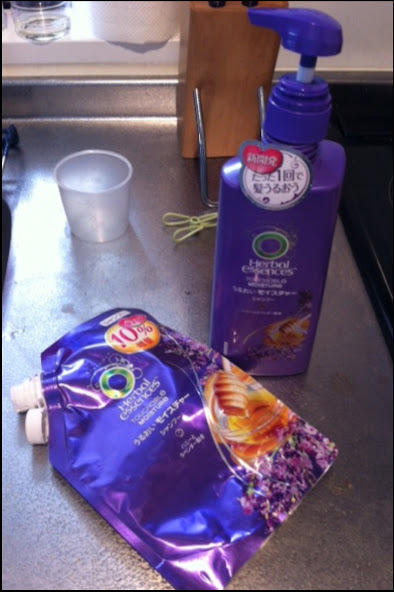 Once emptied into their mother bottle, the pouch can be scrunched up and thrown out with minimal waste. (I wouldn't totally put it past my mother to reuse such an item, but I do feel that it's more of a challenge). Like so much of Japan, this is the height of benri; convenient. I also like the fact the original bottle I did buy for my shampoo has a squirty push nozzle that means I don't have to shake it upside down when it starts getting low. If the best things come to those who wait, I am more than prepared to opt for the second choice. In my apartment, the only slight side effect of this system is the below-average chance of a container truly holding what its label would suggest. Currently, I would say it is a reasonable guess that a shampoo bottle will contain shampoo, but I wouldn't bet anything you truly cared about beyond that point. After all, variety is the spice of life. Or some of us have the sticking power of gnats, depending on your viewpoint. I like them a lot! Cheaper too.